Please contact us if you would like to assist in its development. Students – R. Aharon HaLevi (Raah), Rashba, R. David Bonafed, R. Yitzchak Carcosa, Ramban's son R. Nachman. Halakhic codes – Compendia of the laws of Nedarim, Bekhorot, Niddah, and Challah; Torat HaAdam (on the laws of mourning), Mishpat HaCherem (on the laws of excommunication). Teshuvot – C. Chavel collected and published Ramban's responsa from manuscripts and citations in various medieval works. Printings – Ramban's commentary was first printed in Rome c. 1470.38 A number of annotated editions have appeared in the last half-century,39 with C. Chavel's edition being the most well known and commonplace.40 Click for a table of some of the missing text in Chavel's edition. The writing process – It is unclear when Ramban began to author his commentary,43 but it is clear that he continued to update it until the very end of his life. This is indicated by explicit remarks of Ramban himself in his commentary44 and by lists containing some of these updates which Ramban sent from Israel to Spain.45 The various lists contain only a portion of these additions, and many more can be found by a comparative analysis of the various manuscripts and other textual witnesses of the commentary.46 All together, these total over 270 additions and changes. Click to view an interactive table and analysis of these updates. Very limited presence in the additions – the vast majority of both Ramban's Kabbalistic interpretations63 and his interpretations which are influenced by Radak are present already in the earlier layer of the commentary. Dialectic – Ramban regularly opens his analyses by surveying the exegesis of his predecessors. These alternative interpretations serve as foils for Ramban's own positions. 1 The name "Nachmanides" is a Greek form which means "son of Nachman". 2 From documents from the Aragon Royal Archives, one can glean that Bonastrug ca Porta was the Rabbi of Gerona c. 1260 who was accused by the Church of blasphemy. Most scholars identify him with Ramban. Coincidentally, there was an additional character Astrug ça Porta who lived in the same time period and was similarly accused of blasphemy. See the sources and discussion in R. Chazan, Barcelona and Beyond (Berkeley, 1992): 199-203, 240-242. 3 The earliest source for Ramban being born in the Hebrew year 4954 (1193/4) is R. David Gans's history work, Tzemach David (1592). Other late 15th and early 16th century sources speak of Ramban authoring some of his works already in the Hebrew years 4970-4971 (1210/11). 4 The precise date of Ramban's death is not known. Sefer HaYuchsin v.5 (p.221) gives a date of of 5020 (1259/60), but Ramban's debate in Barcelona was in 1263, his prayer over the ruins of Yerushalayim records his arrival there in either 1267 or 1268 (textual witnesses differ), and it is generally assumed that he lived in Israel for three years. An anonymous student of Ramban, who wrote an account of his travels in Israel which he entitled Totzeot Eretz Yisrael, writes that Ramban is buried at the Mt. Carmel cemetery, but this is debated (as Ramban writes to his son that he was preparing a grave for himself in Hevron). 5 It is unclear where he studied with his teachers. 6 See below that some manuscripts of Ramban's Commentary on the Torah contain lists of additions that Ramban sent from Akko, as well as Ramban's note (appended to many editions of his Commentary on the Torah) describing his arrival in Akko and viewing of an ancient Shekel coin. Ramban's דרשה לראש השנה was delivered at the Tosafist Yeshivah in Akko. 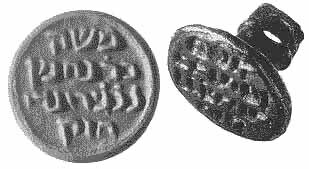 In 1972, Ramban's seal was discovered in excavations near Akko. On the likely authenticity of the seal, see Y. Nir-El and M. Broshi, "חותם הרמב"ן - בדיקת אותנטיות", Tarbiz 65 (1996): 527-528. 7 See below that Ramban's addition to his commentary on Bereshit 35:16 describes his coming to Yerushalayim. In his letterRamban's Letter from Yerushalayim to his son, Nachman, Ramban describes the particularly difficult conditions in Yerushalayim and the refurbishing of a building to serve as a synagogue (there is debate over whether this is the synagogue named after Ramban which exists to this day in the Old City of Yerushalayim). 8 King James I's extremely long reign was characterized by relatively favorable conditions for the Jews of Aragon. His advisors included a number of Jews, and he treated Ramban with considerable respect. 9 See the analysis of his role in Prof. D. Berger's article "How Did Nahmanides Propose to Resolve the Maimonidean Controversy? ", Meah She'arim: Studies in Medieval Jewish Spiritual Life in Memory of Isadore Twersky, ed. by Ezra Fleischer et al. (Jerusalem, 2001): 135-146. 10 Ramban's account of the debate can be found in his Sefer HaVikuach. Ramban records that in recognition of his successful efforts, King James awarded him the sum of 300 dinars, and this is corroborated by a document from the Aragon Royal Archives. 11 See the Responsa of the RashbaResponsa 1:120About R. Shelomo b. Aderet that Ramban received income from this profession. 12 As noted already by R. Shimon b. Tzemach DuranResponsum 1:72About R. Shimon b. Tzemach Duran, RambanHilkhot Nedarim 5 refers to R. Yitzchak as "אדננו הזקן". 13 See Responsa of R. Shelomo b. R. Shimon Duran 291. 14 Ramban had other sons and daughters to whom he refers in his דרשה לראש השנה. His אגרת מוסרIggeret Musar as well as his letter describing Yerushalayim were addressed to one of these sons, and he wrote an additional letter to a son who was active at the king's court. Some (see Kore HaDorot p.19a) have claimed that one of Ramban's daughters was the mother of Ralbag, but this is disputed. 15 See Ramban Pesachim 117bPesachim 117b and Makkot 2a, Meiri Magen Avot 1 (p. 18), Ran Ketubot 74a, Shittah Mekubetzet Bava Batra 82a. 16 See Ramban Shevuot 37a, Derashah LeRosh HaShanah, and his letter regarding R. Yonah (Kitvei Ramban 1:353). 17 According to R. Menachem Recanati (c. 1250-1310), Ramban followed R. Ezra and R. Azriel of Gerona in the chain of Kabbalistic transmission, but their precise relationship is unclear. See below for their influences on Ramban. 18 Ramban describes sending halakhic inquiries to the Ramah – see Ramban Berakhot 22b, Bava Batra 33b, and he appealed for the Ramah's intervention during the second Maimonidean Controversy (see Iggerot Kannaut 6). 19 Many of Ramban's responsa were sent to him. 20 In Ramban's letter to the French scholars during the Maimonidean Controversy, he refers to R. Shelomo as "חברי". 21 Ramban maintained a close relationship with his cousin, R. Yonah, throughout their lives. In his Derashah LeRosh HaShanah Ramban recounts how in his youth he relayed one of his interpretations to the Tosafist academies via R. Yonah. Ramban also wrote a series of letters defending the family honor of R. Yonah. 22 We also possess Ramban's interpretation of Yeshayahu 52:13 – 53:12, written in the aftermath of the Barcelona Disputation, and a lengthy sermon on Kohelet delivered before he departed for Israel. 23 Ramban also wrote a work on the topic of indirect damages (קונטרס דינא דגרמי) and a sermon on the laws of Rosh HaShanah (דרשה לראש השנה). 24 This Talmudic based work defends the Halakhot of R. Yitzchak Alfasi (Rif) from the critique of R. Zerachya HaLevi (Ba'al HaMaor). 25 A defense of R. Yitzchak Alfasi (Rif) from the critique of R. Avraham b. David (Raavad). 26 This work contains a defense of the Halakhot Gedolot's enumeration of the 613 commandments. 27 This is a critique of the work of the Raavad by the same name, and a defense of the positions of the Geonim and Rif. 28 A defense of the Rif from the critique of the Ba'al HaMaor. 29 An account of the Barcelona Disputation. 30 This work was long assumed to be the sermon Ramban delivered in the aftermath of the Barcelona Disputation in response to King James' address to the congregation in the Barcelona Synagogue. In a recent article, though, Oded Yisraeli, "מדרשת 'תורת ה' תמימה' לפירוש התורה: אבני דרך ביצירתו של הרמב"ן", Tarbiz 83:1 (5775): 163-195, argues that this Derashah was actually written before Ramban's Torah commentary. 31 This is the final chapter of Torat HaAdam, in which Ramban discusses various theological issues such as reward and punishment, the World to Come, and Resurrection. 32 This letter has been attributed to Ramban for many centuries (see Shelah, Shaar HaOtiyyot, 4:45), however T. Preschel, "אגרת שיוחסה בטעות לרמב"ן", Talpiyot 8:1 (1960): 49-53, pointed out that most of it contains almost verbatim parallels to the abridgment of a treatise of R. Moshe of Evreux cited in the Orchot Chayyim and Kol Bo. The parallels are so distinct (see Comparison Table) that coincidence can be ruled out. Preschel also rules out the possibility of a mistaken attribution to R. Moshe of Evreux, as a passage of this essay is cited in his name by his student R. Peretz (in a gloss on the Semak 11). Thus, Preschel concludes that the Iggeret Musar is really the work of R. Moshe of Evreux which was ascribed erroneously to Ramban. Chavel (Intro. to the Iggeret) and others disagree and contend that the attribution of the Iggeret to Ramban is correct and that he was working off the work of R. Moshe of Evreux (see further discussion below regarding Ramban's use of sources). 33 The commentary on Shir HaShirim ascribed to Ramban was written by R. Azriel or R. Ezra of Gerona (see the evidence collected in Chavel's Introduction to the Commentary). 34 This work was attributed to Ramban by R. Yisrael AlNakawa (Menorat HaMaor Vol.4, p.87), but see Chavel's introduction that it was likely written by R. Azriel of Gerona. 35 Although ascribed to Ramban already by a student of the Rashba, this work was apparently written by R. Yaakov b. Sheshet of Gerona. The evidence for this can be found in Vida's introduction to R. Yaakov's Sefer Meishiv Devarim Nekhochim, pp. 18-20. See also Chavel's discussion in his introduction. 36 Six of these are dated to the 14th century, while the rest are later. Ramban's later additions to his commentary (see below) are of significant value in mapping the relationship between these manuscripts. 37 Many of the fragments are dated to the 13th or 14th centuries. 38 It was then reprinted in Lisbon in 1489 and in Napoli in 1490. 39 M. Eisenstadt began to publish an edition in 1959, based on the Lisbon printing and corrected according to various manuscripts and other printings, but he published only two volumes covering Sefer Bereshit. 40 Chavel published the full commentary in 1959-60. Chavel's edition (later incorporated in Mosad HaRav Kook's Torat Chayyim) played a major role in the dissemination of the commentary, but its text has some deficiencies. See U. Eitam, "על נוסח פירוש רמב"ן לתורה במהדורת הרב שעוועל", Megadim 30 (1999):73-96, that Chavel's edition used as its base text a 1951 New York printing which was based on the 1860 Warsaw edition (which, in turn, was based on the 1490 Napoli edition), and that it incorporated the numerous corruptions of the text which had crept in at each previous stage as well as additional ones. 41 Many of these manuscripts are from the 14th century, and paleography experts have even dated some to the late 13th or turn of the 14th century (mere decades after Ramban's death). The large number of manuscripts attests to the popularity of this abridgment and the importance attached in Kabbalistic circles to Ramban's mystical interpretations. 43 Ramban's poetic lines at the end of Sefer Shemot, cited by C. Chavel as evidence that Ramban completed his commentary on Shemot after the age of seventy, may be a later addition to the commentary. If so, they would not prove anything regarding the primary layer of the commentary. 44 Ramban's commentary to Bereshit 35:16 describes his change of opinion (to favor Rashi's position) as a result of his travels in Israel ("ועכשיו שזכיתי ובאתי אני לירושלים"), and the note published in many editions at the end of his Torah commentary details a similar change of opinion (also in favor of Rashi) after seeing a shekel coin in Akko. An account of this later shift and Ramban's sending a correction back to Spain is recorded also by R. Yosef AlboSefer HaIkkarim 3:16About R. Yosef Albo. 45 These lists appear in five manuscripts, four of which were collated and published by K. Kahana, "הוספות הרמב"ן לפירושו לתורה", HaMaayan 9:1 (1968): 25-47. See also the earlier article of M.Z. Eisenstadt "מכתב הרמב"ן מארץ ישראל בענין צורת השקל ומשקלו", Talpiyot 4:3-4 (1959): 606. Regarding the differences between the nature of these lists, see the discussion in Ramban's Updates. 46 Most of the additional cases in Bereshit can be found in M. Sabato, "הוספות רמב"ן לפירושו לתורה", Megadim 42 (2005): 61-124. The lists and analysis presented here for the entire Torah are based on the research of H. Novetsky – see note below. 47 The lists of hosafot and the analysis presented here are based on an unpublished seminar paper by H. Novetsky, "Nahmanides' Amendments to his Commentary on the Torah", submitted (in 1997) to Prof. David Berger, and his subsequent analysis (in 2001) of the available microfilms of the Ramban manuscripts housed at the מכון לתצלומי כתבי יד of the Jewish National University Library. The paper was shared with Prof. Yisrael Ta-Shma z"l, who then shared it with Jonathan Jacobs. Cf. Jacobs's recent article "ספרים חדשים שהתגלו לרמב"ן בהגיעו לארץ ישראל", JSIJ 11 (2012). 48 See Ramban's updates to Bereshit 11:28, 12:6, 13:7, 14:6, 14:15, 23:2, 35:16, 35:18, 48:7, Shemot 10:14, 12:2, 30:13 (see also note on Shekel at end of Torah commentary), Bemidbar 13:2, 21:18, 35:14, Devarim 8:9, 11:29. 49 This possibility was noted already by K. Kahana (pp. 42,44) with regard to both R. Chananel (see below) and Ibn Tibbon's translation of Moreh Nevukhim. 50 Many Tosafists and their students lived in Akko, and Ramban was in contact with them (see his Derashah on Rosh Hashanah). 51 See Ramban's additions to Bereshit 19:2, 29:9 (R"Y Bekhor Shor Bereshit 29:17), 33:10, 35:16 (R"Y Bekhor Shor Bereshit 48:7), 37:22, 42:9 (R"Y Bekhor Shor Bereshit 37:26), Vayikra 19:14, 19:17, Bemidbar 21:13-20, Devarim 11:4, 21:18-21 (see also Devarim 16:21, 21:11,12). In a number of these cases, R. Yosef Bekhor Shor's exegesis was also incorporated (almost verbatim) into Chizkuni, and it is possible that Ramban received it through this secondhand source. Either way, though, there appears to be a strong possibility that through his contact with the Tosafists in Akko, Ramban gained access to Northern French exegesis which he had not previously seen. Whether Ramban actually saw a written copy of either R. Yosef Bekhor Shor or Chizkuni or merely heard the content orally is a secondary issue. While many of the most distinctive parallels are from Ramban's additions in Israel, there are also numerous parallels between Ramban and R"Y Bekhor Shor (as well as Chizkuni), even in passages which appear to be from the earlier Spanish portion of the commentary. See H. Novetsky, "The Influences of Rabbi Joseph Bekhor Shor and Radak on Ramban's Commentary on the Torah", (MA Thesis, BRGS, Yeshiva University, 1992). 52 They are cited in Ramban's additions to Vayikra 13:29 and 24:10. In the first case, the position is found in the commentary of R. Shimshon of Sens on Nega'im 10:10. This dovetails nicely with Ramban's statement in his Derashah on Rosh Hashanah, which he presented in Akko, that it was there that he viewed the Tosafot of R. Elchanan for the first time ("ועכשיו בעיר הזאת ראיתי התוספות הארוכות של הרב ר' אלחנן ז"ל"). The exegesis in Vayikra 24:10 appears also in Chizkuni. 53 See note above regarding R"Y Bekhor Shor. 54 The citations of R. Chananel in Shemot 10:14, Vayikra 20:17, 23:7, Bemidbar 16:5, 16:21, and 20:1-8 are all Eretz Yisrael additions, as noted already by K. Kahana (p. 42). Interestingly, there are no citations of R. Chananel in Bereshit or Devarim. 55 The citation of R. Nissim in Bemidbar 8:2 is a later addition. 56 Cited in Ramban's additions to Bereshit 14:6, 30:20 (2x), Shemot 28:41, Bemidbar 11:28, Devarim 8:9, 33:25. Ramban's citation of the Targum Yerushalmi in Vayikra 19:20 comes via Radak, and Bemidbar 24:1 is not a direct citation. This leaves Bereshit 1:1 as the only citation in the original layer of the commentary. [Ramban's citation of Targum Yerushalmi in his commentary to Iyyov 33:25 likely came via the Arukh s.v. רפש.] That the Targum Yerushalmi was not always readily available in all lands is reflected in the responsum of R. Hai Gaon in Teshuvot HaGeonim Zikkaron LaRishonim #248 ("אין אנו יודעין תרגום ארץ ישראל מי אמרו, ואף אין אנו יודעין אותו גופו ולא שמענו ממנו אלא מעט"). 57 It is clear that Ramban had access to a Talmud Yerushalmi while in Spain, however, his access there may have been more limited and he may have studied it less. Ramban's additions cite the Talmud Yerushalmi numerous times: see Bereshit 34:13 (this citation refers to a version of the Talmud Yerushalmi different than ours), 40:16, 49:10, 49:19, Shemot 31:13, Bemidbar 4:16, 25:5, Devarim 2:23, 10:1, 20:8, 26:2, and the concluding comment at the end of the Torah. 58 Ramban cites this work only once, in his addition at the very end of his commentary. 59 Ramban's additions to Bereshit 11:32 and Devarim 15:1 match the Lekach Tov almost word for word. See also the parallel in the addition to Shemot 32:27. 60 Cited in Ramban's addition to Vayikra 11:13. 61 Cited in Ramban's addition to Devarim 18:9. 62 See the additions in Bereshit 19:8, 49:10, Vayikra 27:29, Bemidbar 1:3, 16:21, 26:54. The exceptions which appear to be present already in the earlier layer of the commentary are: Shemot 20:23, Vayikra 27:29 (part), Bemidbar 32:33, Devarim 20:11. 63 Some of the rare exceptions are: Bereshit 15:17, 49:33, Shemot 20:13, Devarim 18:9. Ramban's addition at the end of his introduction, in which he warns the uninitiated reader not to delve into his mystical interpretations, may be a reaction to the popularity of that layer of his commentary already in Ramban's lifetime, or possibly to the dissemination during Ramban's lifetime of the "Peirush HaKatzar" (see above). 65 Cf. Rashi, Ibn Ezra, and Radak. Partially for this reason, Ramban's comments tend to be much longer than those commentators, as he will frequently examine issues of broader scope. For a more detailed comparison table of the various exegetes, see Commentary Comparison. The relationship between Rashi and Ramban's Torah commentaries is analogous in many ways to the relationship between the Talmudic commentaries of Rashi and the Tosafists. 66 For statistical analysis, see Table. 67 It appears that already in Ramban's lifetime and in the period after his death, the mystical portion of the commentary became very popular in Kabbalistic circles – see below.